Wednesday is the longest night of the year, and in many U.S. cities it will also be one of the coldest. Even so, more than a half-million Americans will be sleeping outside or in homeless shelters. This week, activists are holding vigils around the country to remember the thousands of homeless people who died this year, many of them prematurely. If you look at the list of the 46 homeless individuals who died this year in Washington D.C., you'll notice that almost all of them were in their 40s or 50s — people like Shawn Simmons, age 44, and Bernadette Byrd, age 53. "Being without housing is just, it's like a spiral. You're just kind of spiraling down," says Robert Warren, who was homeless during two stretches of time in the nation's capital. 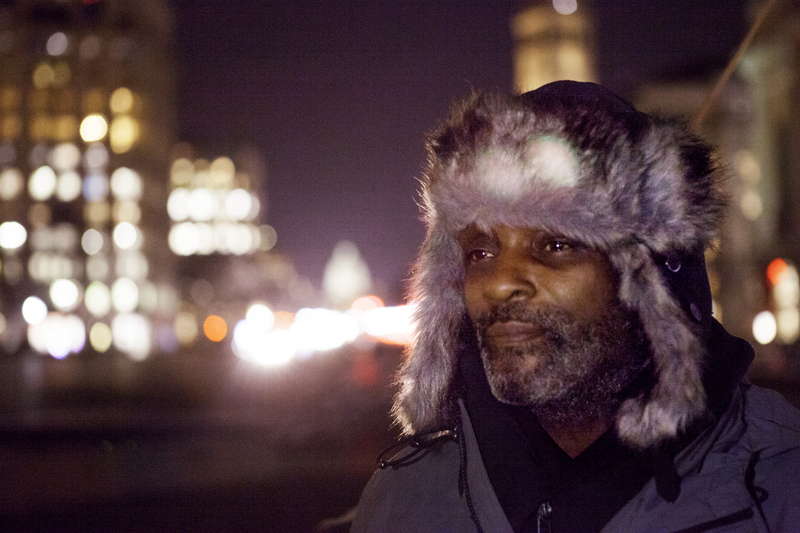 Robert Warren was homeless during two stretches of time in the nation's capital. Now, he is an advocate for the homeless and organizes memorial services like the one on Tuesday. Now, he's an organizer of the city's homeless memorial service, held each year to recognize people like his friend Kanell Washington, who was homeless for almost 30 years. 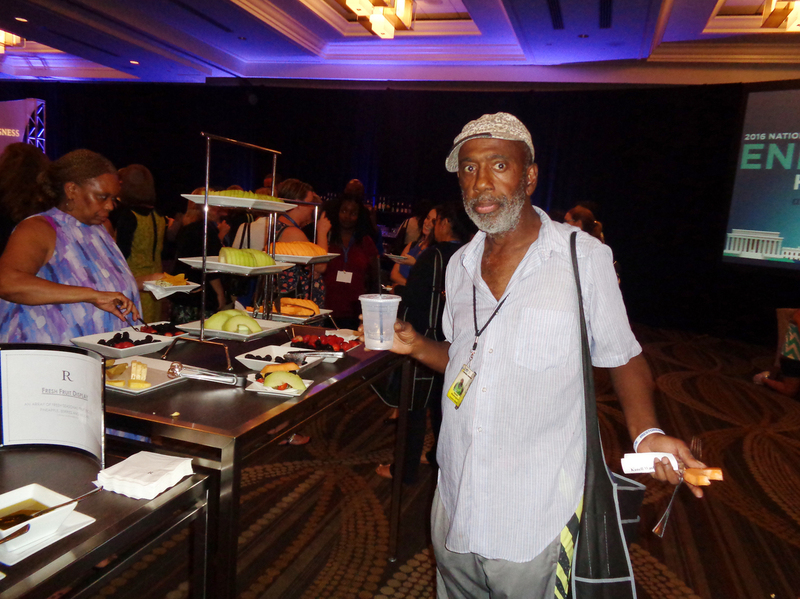 Washington was supposed to be helping with this year's service, but he died suddenly in October of kidney failure. At age 60, he was one of the older ones. "To lose him, you know, just like that — you know, it's like, he was just gone," says Warren. "It was kind of hard." But it's not that unusual. Studies have found that the mortality rate for homeless individuals is three to four times greater than the overall U.S. population. And life expectancy is at least 12 years shorter than for those who are not homeless. Many of those living on the streets have problems like diabetes, heart disease, mental illness and substance abuse. And being homeless only makes matters worse. Kanell Washington was supposed to be helping with this year's vigil in Washington, D.C., but he died suddenly in October of kidney failure. Jesse Rabinowitz of Miriam's Kitchen, a local service provider, says living outside can be a strain both physically and mentally. Not only do people have to deal with the elements and the dangers of living outside, but access to health care is limited. Many homeless individuals use hospital emergency rooms in place of a doctor's office. And when they do get treatment, they often have trouble following up. Their pills can be stolen or they might have no place to store medication that needs refrigeration. Rabinowitz says he hears "diabetics talk about getting harassed, or confronted by the police when they inject insulin because they think it's a controlled substance." Rabinowitz says the tragedy in Kanell Washington's case is that he learned just days before he died that he had finally been approved for a government voucher to get his own apartment. That was also the case for more than a dozen others who were commemorated in an overnight memorial service in the District on Tuesday. They had vouchers but died before they could be housed. 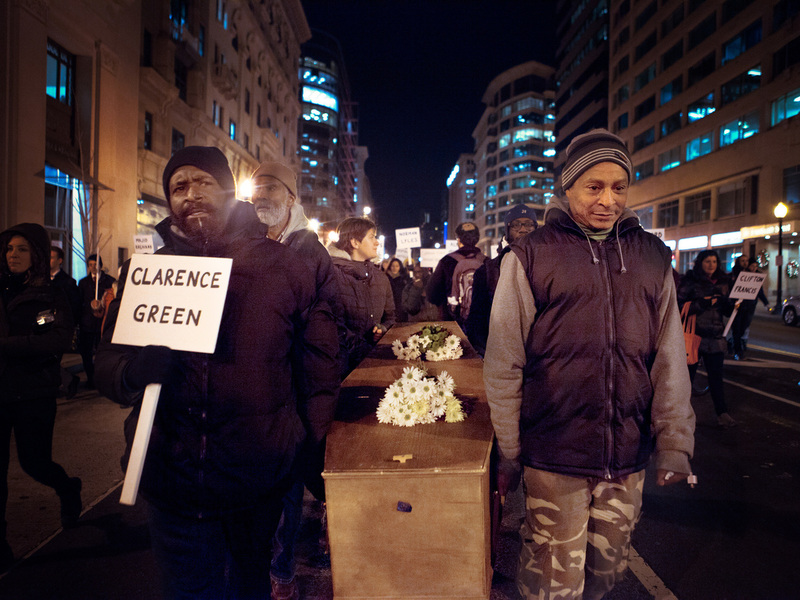 Although no one really knows how many homeless individuals died in 2016, about 2,700 were expected to be commemorated at vigils across the country. 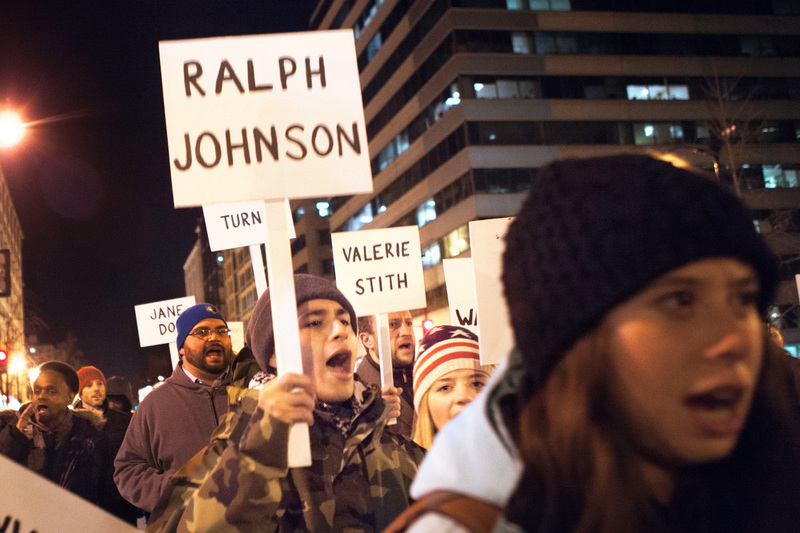 About 100 homeless individuals and their supporters began the vigil in D.C. by marching down a busy city street carrying small lights and signs with the names of all those who had died in the city this year. Leading the procession were several men bearing a plain wooden casket. "What do we want? Housing! When do we want it? Now!" the marchers chanted, as they made their way toward an outdoor plaza one block from the White House, where they planned to spend the night in a tent. As they walked, they passed several homeless people wrapped in blankets to protect themselves against the freezing temperatures. Washington has among the largest homeless populations in the country — about 8,000 people on a given night. Among those whose names were printed on the white signs carried by the marchers was Michael Woolfolk. He was found on a local street last month, slumped in a wheelchair. A passerby was concerned by the cold temperatures and shook him only to discover that he had died, apparently of hypothermia. He was 48 years old. Marchers at a vigil in Washington, D.C., on Tuesday carried signs inscribed with names of the 46 homeless people who died this year in the city. At the start of the memorial service, Warren, the organizer, noted that winter can be an especially difficult time for those living outside. "We know that there's going to be folks sleeping out there in the cold, dying and getting sick, and it doesn't have to be that way," Warren says. Warren and others are pushing for more funds to provide housing for the homeless, although in cities like Washington, where rents are soaring, it's hard to keep up with the demand. No one really knows how many homeless individuals die each year, but about 2,700 were expected to be commemorated this year at similar events across the country this week. 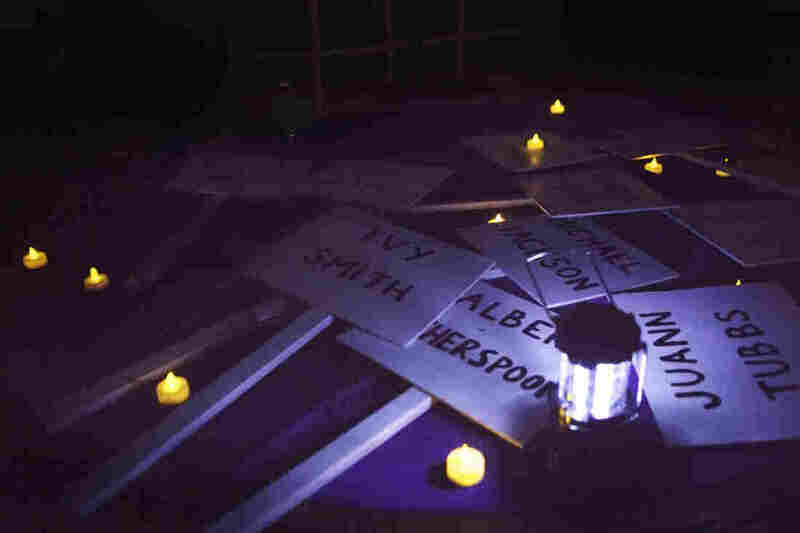 The homeless memorials have been held for more than 25 years. Each year, organizers say they hope it's the last.